Mo Yan and the ghosts of the 1979 war. The Sino-Vietnamese war of February-March 1979 is forgotten despite the current tensions between the two countries, particularly with regard to the Spratley islands. A conflict evoked by Mo Yan in a short novel, “The Reunion of Companions in Arms” (1), a book of 1992 where Mo Yan shows once again the extent of his talent. La presse en France, n’a jamais montré beaucoup d’intérêt pour la littérature chinoise. Et pourtant c’est en France que Mo Yan est le plus publié (17 livres) du fait de la passion d’un petit groupe d’éditeurs et de traducteurs. Mo Yan, peut-on être à la fois Chinois et Prix Nobel? (1). After the controversy over the Nobel and Mo Yan, why not read his books? 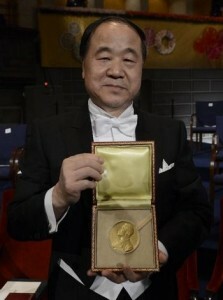 The award of the Nobel Prize for Literature to the Chinese writer Mo Yan led to an intense debate in the media, both in China and abroad. Some have strongly regretted that a Communist Party member, vice-president of the Writers’ Union, is awarded the prize, others that Mo Yan is not a radical critique of the Chinese regime or an unreserved supporter of the dissidents. 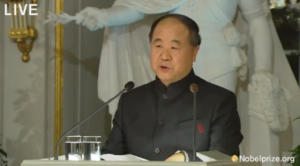 Mo Yan: short stories by a Nobel prize. These last months, Mo Yan has been on the top of the news: the French publication of “Frogs” (1) followed a few days later by the award to this novel of the Mao Dun Prize (shared with four other writers) but a prize of 50,000 euros each. Mo Yan, “Frogs” and birth control policy. 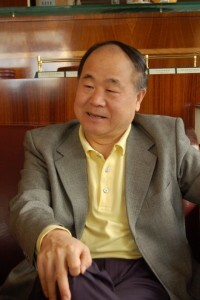 Mo Yan is probably the greatest living writer of Chinese nationality. His latest novel, “Frogs”, is devoted to his aunt ,77 years old, who helped his birth – like 9983 other babies – and, half angel, half-demon, was also responsible for the local birth control policy. As such, she has performed thousands of abortions. “Frogs”, the latest novel by Mo Yan. If you like Mo Yan, cheer up. As was told during his interview to Rue89 (30/08/2009), his novel “Frogs” has just been published in Beijing. “Frogs”, “Wa” in Chinese is pronounced like Nu Wa, goddess in Chinese mythology who created humanity, more over the frog in some provinces is the symbol of fertility. With a reincarnation, Mo Yan revisits the history of Communist China. Originally published on Rue89- 30/8/2009. A new novel by Chinese writer Mo Yan is an event: “The Harsh Law of Karma” (the french translation for ”Life and death are wearing me out”) is no exception. Through an animal reincarnation cascade, he leads the reader through the Chinese history of the last sixty years. 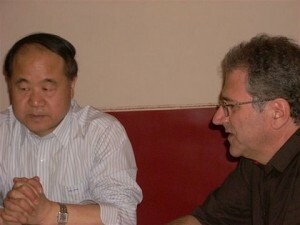 During his visit to Paris in June 2009, Rue89 met Mo Yan, who had presented his latest work. Mo Yan, the dictatorship of the Party and the market. Originally published on Rue89, 24/6/2009. The Chinese writer Mo Yan spent a week in France to present his books and his new novel to be releasd end of august.He met Rue89 with Bertrand Mialaret and Pierre Haski who had met him some years ago in Beijing. A meeting translated by Chantal Chen- Andro, translator of many books by Mo Yan. Originally published on Rue89, 24/11/2008 . If you are a vegetarian, do not read this novel! You will live in modern China, the passion for meat, the slaughtering, processing, consumption of … Meat and alcohol as allegories of greed and modern debauchery.